Mariam Galoustian has over 14 years experience in the musical world. 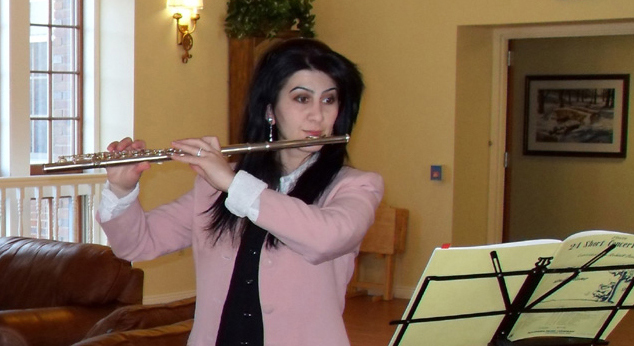 First as a flutist with Kohar Symphony Orchestra & Choir, then music teacher with St Sahag Music School. If you would like to learn how to play the flute, saxophone or recorder or improve your skills playing these insturements, then contact Mariam today to schudule your first lesson for free. Flutes were known to exist in ancient civilizations. Over the years,they have been made of wood or metal. Early flutes,such as recorders, are played pointing forward. The other type of flute, called a transverse flute until the mid-1800s,is played to the side. In 1847, Theobald Boehm designed the modern flute. This flute is capable of playing with more volume than older flutes. The keys Mr.Boehm added also allow the instrument to play a full chromatic scale,and help it to play better in tune. The flute family includes the C Flute (the most common), C Piccolo, Alto and Bass Flutes .As the highest pitched members of the concert band, marching band and orchestra, flutes play melodies, harmonies and solos, and are important members of the woodwind family. J.S.Bach,Claude Debussy and Ralph Vaughan Williams are important composers who have written music for the flute. Some famous flute performers are Louis Moyse and James Galway. The saxophone was invented in 1841 by a Belgian clarinetist named Adolphe Sax. After settling in Paris, Sax patented his new invention in 1846. The instrument soon became popular across all of France .Many American musicians visiting Europe took a liking to the saxophone, and it soon found a home in America, where it has remained popular ever since. Adolphe Sax actually created 14 different sizes of saxophones, seven for orchestra pitched in C and F, and seven for band , pitched in B flat and E flat. The only saxophone still in common use today are the E flat. Alto saxophone, and the B flat. tenor saxophone, and the E flat baritone saxophone. The B flat soprano saxophone is also used occasionally, especially in jazz and small ensemble music,and a few orchestra pieces call for C tenor saxophone. Although saxophones are built in different keys and sizes, each uses the same fingerings, allowing saxophone players to transfer from instrument to instrument with ease. The saxophone was invented to be a bridge between the woodwind and brass sections, and to boost the sound of the woodwind section in military bands. The saxophone is classified as a member of the woodwind family because of its flute-like key system and use of reed. Today, alto saxophones are played in concert and marching bands, jazz ensembles, small chamber groups, and occasionally in orchestras.They are often featured as solo instruments.